In its 2013 Expense IQ Report, Concur, a developer of expense report software, has found that business travel expenses fell off dramatically at the end of 2012. The average travel and entertainment expense report fell 4.5 percent from 2011 to 2012. The decline dramatically accelerated in the last quarter of the year, when a huge 21 percent drop in T&E expenses was measured. 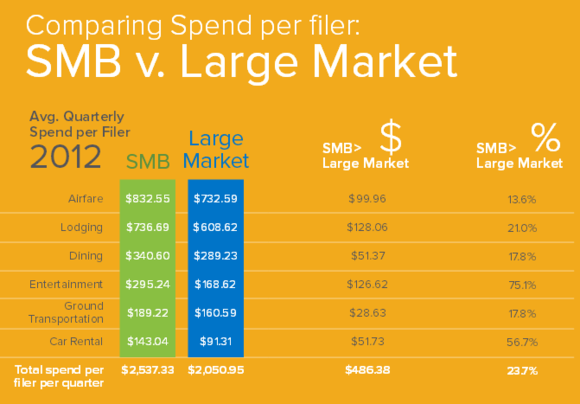 Curiously, Concur notes that small businesses are spending considerably more on travel than their large-company counterparts. On a quarterly, per traveler basis, SMBs pay more for airfare (13.6%), lodging (21.0%), car rentals (56.7%), and even dining out (17.8%). Partly this is because small-business employees are traveling more than large ones, but also because they are often subject to higher rates. In explaining this, Concur notes that private rate agreements with hotel chains, for example, are responsible for offsetting many of the costs that large businesses pay. Looking at the broader, year-to-year numbers, it’s clear that travel, on the whole, is on the decline. Every expense category decreased from 2011 to 2012, some by double digits, except for one: meetings. These expenses include so-called “local cluster” meetings, which involve employees gathering at telepresence sites, like a nearby hotel with a conference room and videoconferencing capabilities, in order to avoid the cost of flying half the staff across the country. Of course, it pays to minimize travel and entertainment expenses to whatever extent you can. With the average small business now spending more than $2,500 per quarter per flier, these fees are not inconsequential, even if you don’t spend your entire life on the road. 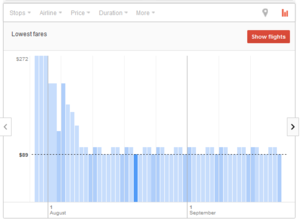 Google Flight shows best rates for up to two months out. Here are some tips for helping to minimize those T&E expenses. Start with Skype. Virtual meetings are becoming more accepted than ever, to the point where there’s often less and less of a reason to hop on a plane to see someone when you can simply dial them up from your desk via video chat. Quality isn’t perfect (and it may never be), but it can be surprisingly effective. Try to bargain. It doesn’t hurt to ask for a group rate with hotels, car rental agencies, and even some restaurants. The big guys get discounts based on volume, but you might be able to shave a few bucks off in exchange for loyalty. Hidden costs add up. Watch out for “ancillary” fees like checked bags, priority access and club fees, and ticket change expenses, all of which are on the rise. Your company should have policies in place regarding all of these costs. Plan ahead. Travel gets awfully expensive when you get within 10 days or so of your flight. If you do have to go somewhere, plan as far ahead in advance as possible. Google’s new Google Flight system is one of the best fare-finding tools around. Click the bar code icon (top right corner) to see how prices are changing for travel over the next two months.